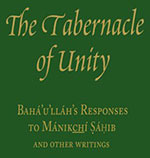 A new volume of selected writings by Baha’u’llah, entitled “The Tabernacle of Unity,” has been recently translated and published in English. This latest publication of the Baha’i World Centre contains five “tablets” – letters – written by Baha’u’llah to individuals of Zoroastrian background in the 1800s. As such, these tablets provide important insights into the interrelatedness of religion. […] While portions of these tablets have been previously translated, the volume represents the first time they have been presented in English in full. For example, the well-known quotation, “Ye are the fruits of one tree and the leaves of one branch,” comes from the second tablet of the book which was addressed to Mirza Abu’l-Fadl, a famous early Baha’i scholar.